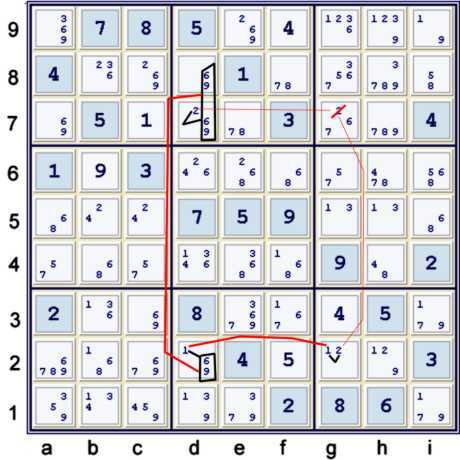 The following illustrated solution for the Tough Sudoku of June 12, 2009 exhibits a path to solution that is meant to be instructive. There certainly are solution paths available for this one that could employ far fewer steps. This path attempts to keep the steps, though many, individually short and relatively simple. As has been my recent tendency, some deductions that rely upon the fact that the puzzle has exactly one solution are employed. 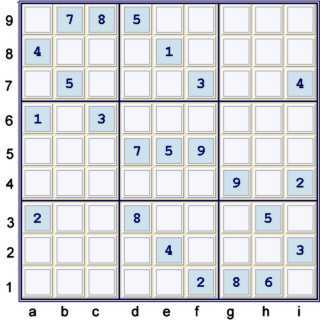 The set of Sudoku solving techniques, strategies, tips and tricks employed in this solution are mainly for those familiar with advanced type techniques. If this is your first visit to this blog, welcome! Unfortunately, if you are a first time visitor, this page may seem like it is written in a different language. Well, it is!! Previous blog pages may be helpful. Links to these pages are found to the right, under Previous Entries. The earliest posts are at the bottom, and if you have never perused the intricacies of our special coded language here, you may wish to start close to beginning. 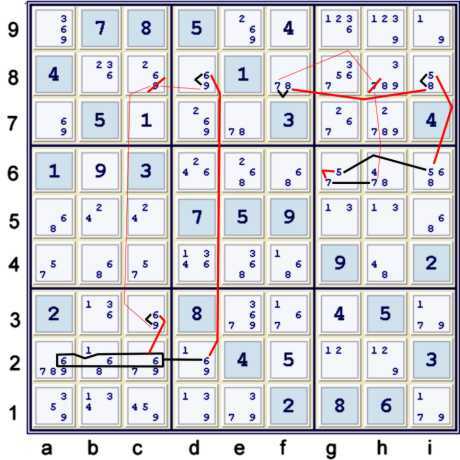 Then again, you may just decide to jump in and have fun decoding! 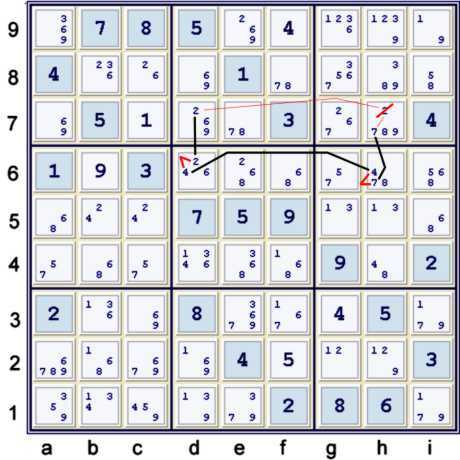 This brings the puzzle to the point where the program, Simple Sudoku, has exhausted its solving technique set. 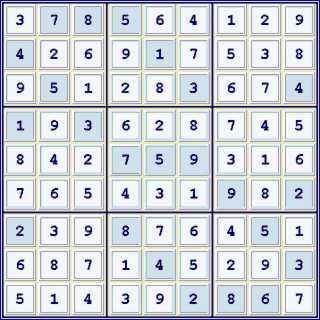 Typically, this is the point where the puzzle gets interesting for those who like tough Sudokus. Below, note that candidate (1) in columns gh is limited to rows 259. Note further that candidate (2) is rows 29 is limited to gh29 plus e9. If cell e9 does not contain (2), and cells gh5 do not contain (1), then the puzzle would contain hidden pair 12 at both gh9 and gh2. 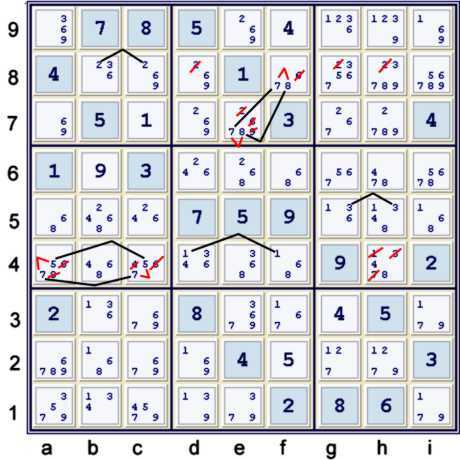 This would form a Unique Rectangle, (also called a deadly pattern). 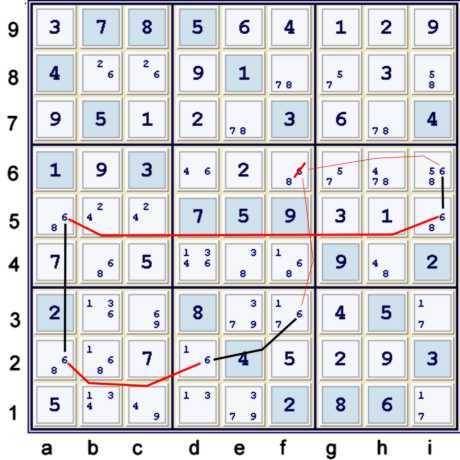 Any puzzle that has only one solution cannot have such a pattern, as this pattern cannot be resolved uniquely. Thus, it is safe to say that at least one of the following must be true: (2)e9, (1)g5, (1)h5. Such a set, whereas at least one item in the set must be true, is called a Strong Inference Set (SIS). An Almost Locked Set (ALS). Specifically, (1269)d278 => SIS[(2)d7, (1)d2] In the chain below, I denote this particular ALS inference using NP, Naked Pair. 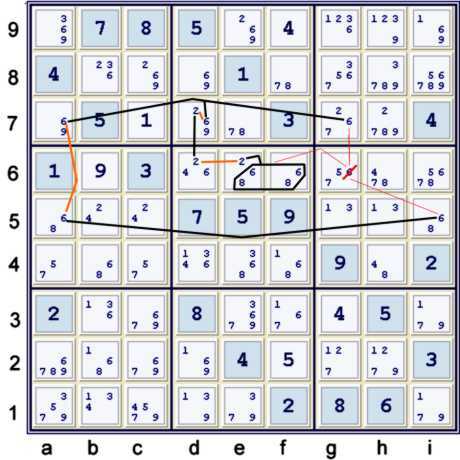 This will bring the puzzle to the same point as it is before step 2m below. The step below can be represented in many ways. The illustration below reflects the way that I find such steps. 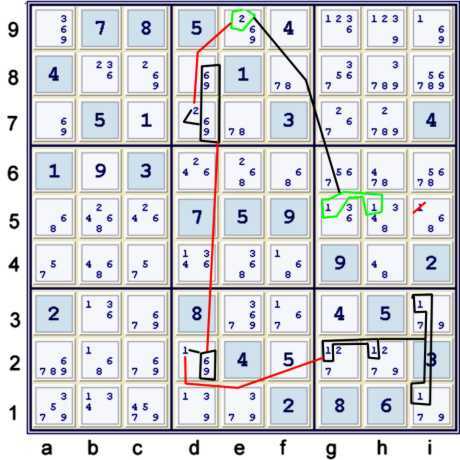 During my typical sweep of a puzzle for eliminations resulting from the locations of just one type of candidate, I often see many Almost eliminations. When one of these overlaps with another Almost chain during later investigations, I know that I have found a valid elimination. 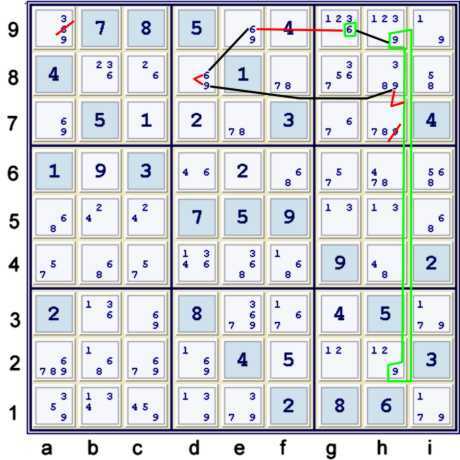 Below, I use the almost Skyscraper with candidate (6) in rows 57. But for the (6) at d7, one would have a normal Skyscraper: (6): g7 = a7 - a5 = i5 => g6≠6. (HT568)i568 => i89≠6, i8≠79, i6≠7. At this point, the puzzle is significantly undone, although we have not solved any more cells. Step 2m: The very easiest of the Y Wing Styles. Also called a W Wing. The name, W Wing has been poplularized for the following type of step. The key to a W wing is two cells limited to the exact same two candidates, plus a Bi Location link using one of those two candidates that sees both cells. Also illustrated below is step 2n. Step 2o: A Y Wing Style using only bi-locals. The step below can also be considered as being a typical ALS x ALS with a restricted candidate, in this case the restricted candidate is (1) in row 2. A MUG is a pattern which cannot be resolved uniquely, like a Unique Rectangle. However, a MUG is not generally restricted to bivalues. MUGs can be impervious, meaning that all the candidates in the MUG are locked in each of their large containers: Row, Column & Box. A MUG can be pervious, meaning that the candidates are not locked into all of their large containers. A pervious MUG can generally be represented as a Symmetric Pigeonhole Matrix of impervious Uniqueness patterns. This means that with a pervious MUG, at least one impervious Uniqueness pattern must exist. (NT123)h259 => ditto for contents of cells h259 in column h.
These three possibilities, at least one of which must be true, are highlit in green below. They form a SIS used in a very short and simple chain, which happily happens to also be a wrap around chain, or continuous AIC loop. At this point in the puzzle, seeing this potential MUG is rather easy, as so many of the potential MUG cells have been depopulated of other candidates. BTW, this particular MUG has been available for quite some time. However, before now the potential chains emanating from it were longer and more complex, albeit still quite powerful.